Pick any of the beers from the McLaren Vale Beer Company. Chances are good there will be beer geeks who hate them. All of them. Maybe it’s got something to do with the fact that they never had a brewery in McLaren Vale for ages (though I think they do now). Maybe it’s because the packaging looks a little too slick, a little too corporate for a “craft” brewery. Or maybe there are some other weird reasons I don’t even understand. 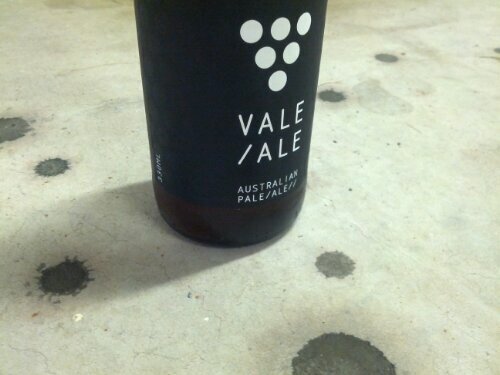 I do know that a number of geeks were displeased when this beer, the Vale Ale, snuck into the Local Taphouse Hottest 100 top 10 – in ninth spot. No doubt there were also pissed that the IPA came in 14th place and the lager (which they irritate me by calling “Lgr”) in 89th spot. The positioning doesn’t bother me. All the McLaren Vale beers pass my barbecue test. That is, if I turn up to someone’s barbecue without my own refreshments and the host hands me [insert beer name here] how do I feel about it? If I look down at my hand and see the three dots, then I’d be happy with that. With this one I like the light hoppy notes and the way they interplay with the malt. And I’ve drunk more than a few of them on a warm afternoon and been thoroughly refreshed. So it’s a thumbs up from me for this one.